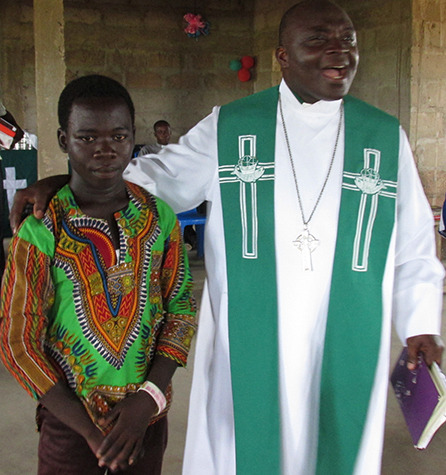 It was a sight to behold: in Bawku, northern Ghana, hundreds of Lutheran youth paraded through the streets to the palace of the paramount chief of the Kusasi tribe – who happens to be an idol worshipper. Studying the Word was an important part of Ghana’s Evangelical Lutheran Youth Fellowship, attended by over 700 young Lutherans aged 10-35. The convention included a Bible quiz, doctrinal quiz, debate, soccer competition, Bible studies, and house-to-house evangelism. “All our youth have studied the Small Catechism (which is where the questions from the doctrinal quiz came from),” said Rev. Salifu. “In fact, I was deeply impressed by the way the children answered the quiz questions. A young man named Josiah Abanga stole the show. He never missed any question that was given him! Under Rev. Salifu’s guidance, LHF is working on catechisms and Bible storybooks in the Kusaal, Komba, Akan and Bimoba languages for Ghana.